Measure many important standard Image Quality factors, including sharpness, noise and texture blur from a single image using Imatest 5.0 Arbitrary Charts Module. 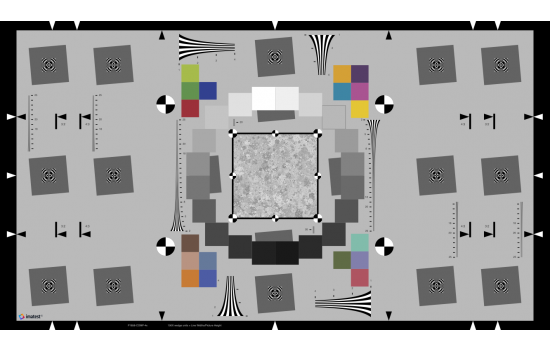 This test chart combines a set of features which follows the 2016 IEEE P1858 Camera Phone Image Quality standard for analyzing SFR, Visual Noise, Color Uniformity, Lateral Chromatic Displacement, and Texture Blur. Analysis of these features directly follows the standard or is in close agreement. Analyzing an image of this chart in the Arbitrary Charts Module provides results for these five metrics from a single image instead of four separate images. Note: The results are not all strictly in line with the CPIQ testing requirements, though they are derived from and consistent enough with them to give a good estimate of the strict testing results.